A big THANK YOU to the UTSA students, alumni, parents and friends who have helped raise more than $25,000 to Bring Rowdy Home! Check out the donor honor roll to see the names of the donors who will forever be known for bringing a landmark roadrunner statue to campus. If you missed the campaign, it is never too late to give. Additional gifts will fund the installation of the statue as well as cover any maintenance costs. Make a gift today! Make history and be part of a new tradition by bringing the first permanent roadrunner statue to campus! University students and officials recently selected a statue created by blacksmith artist R. G. Box of Lubbock, Texas, to be the ultimate symbol of UTSA pride. For generations to come, UTSA students and graduates will gather around Rowdy to celebrate milestones. The iron Rowdy is six-feet high, 11-feet long and weighs a whopping 1,000 pounds. It took about 1,000 hours to build it, feather by handmade feather. It is truly a piece of art! To bring the statue home to UTSA permanently, we need to raise $25,000 in just a few days. Alumni, students and community friends—we need your support now. 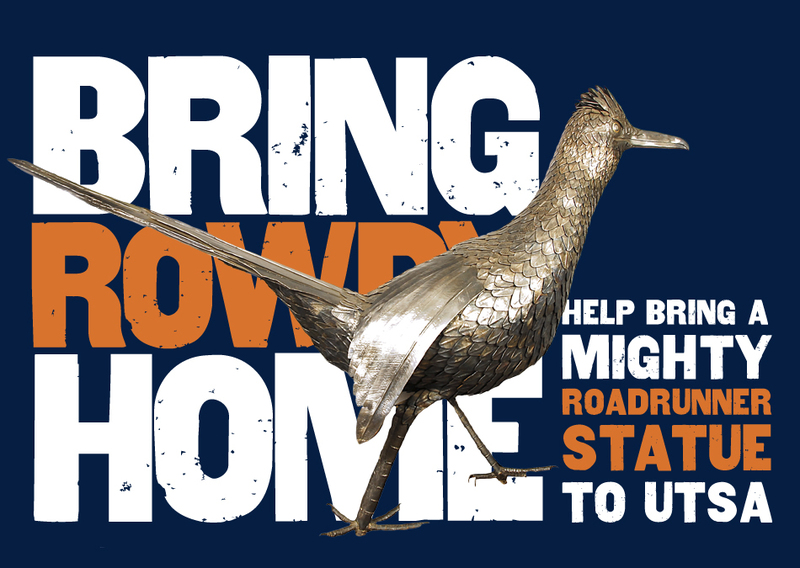 Be part of UTSA history and help Bring Rowdy Home! Where will Rowdy "roost" on campus? Students and staff are evaluating "nest" options on the Main Campus. Where can I see the statue? The statue will visit the Alamodome for the OSU vs. UTSA home opener football game on September 7, 2013. Come to the game to see the statue in person, take pictures and make your gift to Bring Rowdy Home. We need to spread the word! You can help by making a gift, encouraging others to give and sharing information on Facebook, Twitter and Instagram with the hashtag #BringRowdyHome. We especially encourage alumni to give. Alumni giving is so important to building traditions at the university. Your gift will not only Bring Rowdy Home but it will improve the alumni giving rates that are reported for national rankings—improving UTSA's reputation, making your degree even more valuable. What happens if more than $25,000 is raised? Money raised over the amount to purchase the statue will be used to enhance Rowdy's permanent home as well as protect and maintain the statue. Students have recommended that the statue be lit; to properly protect the statue a security camera will need to be installed. Will I get anything for giving? Donors to Bring Rowdy Home will be recognized for your pride to "feather the nest" and we are working on a special way to honor your commitment. We will keep you up to date on the progress to build Rowdy a permanent home on campus and you'll be invited to the dedication. Everyone who supports this campaign will be included on our online Bring Rowdy Home Donor Honor Roll. If you would prefer that your name is not listed please email us at giving@utsa.edu. Yes! Gifts to UTSA are tax deductible, as allowed by law. Can I mail my gift? or call (210) 458-4130 for more information.